Previous reports by the Director General have identified outstanding issues related to possible military dimensions to Iran’s nuclear programme and actions required of Iran to resolve these. Since 2002, the Agency has become increasingly concerned about the possible existence in Iran of undisclosed nuclear related activities involving military related organizations, including activities related to the development of a nuclear payload for a missile, about which the Agency has regularly received new information. DOE, NRC, and State are not able to fully account for U.S. nuclear material overseas that is subject to nuclear cooperation agreement terms because the agreements do not stipulate systematic reporting of such information, and there is no U.S. policy to pursue or obtain such information. Section 123 of the AEA, as amended, does not require nuclear cooperation agreements to contain provisions stipulating that partners report information on the amount, status, or location (facility) of special nuclear material subject to the agreement terms. However, U.S. nuclear cooperation agreements generally require that partners report inventory information upon request, although DOE and NRC have not systematically sought such data. We requested from multiple offices at DOE and NRC a current and comprehensive inventory of U.S. nuclear material overseas, to include country, site, or facility, and whether the quantity of material was rated as Category I or Category II material. However, neither agency has provided such an inventory. NMMSS does not contain the data necessary to maintain an inventory of U.S. special nuclear material overseas. DOE, NRC, and State have not pursued annual inventory reconciliations of nuclear material subject to U.S. cooperation agreement terms with all foreign partners that would provide the U.S. government with better information about where such material is held. 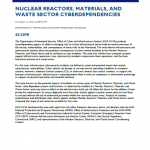 Furthermore, according to DOE, NRC, and State officials, no U.S. law or policy directs U.S. agencies to obtain information regarding the location and disposition of U.S. nuclear material at foreign facilities. Spent fuel, after it is removed from the reactor core, is safely stored in specially designed pools at individual reactor sites around the country. The spent fuel is first placed into a spent fuel pool (Figure 1), which is like a deep swimming pool with racks to hold the fuel assemblies. It allows the fuel to begin cooling. The spent fuel is moved into the water pools from the reactor along the bottom of water canals, so that the spent fuel is always shielded to protect workers. Fuel assemblies are covered by a minimum of 25 feet of water within the pool, which provides adequate shielding from the radiation for anyone near the pool. Spent fuel pools are very robust structures that are constructed to withstand earthquakes and other natural phenomena and accidents. They are typically rectangular structures 20 to 40 feet wide, 30 to 60 feet long, and at least 40 feet deep. The outside walls are typically constructed of more than 3 feet of reinforced concrete. Spent fuel pools at pressurized water reactors (PWRs) are commonly located within an auxiliary building near the containment. Many of the PWR pools are located in the building’s interior. At boiling water reactors (BWRs), spent fuel pools are typically located at an elevated position within the reactor building, outside the primary containment area. Nuclear power plants in the U.S. use fuel rods that have been enriched in the uranium-235 (235U) fissile isotope. At the time of their insertion to the reactor, typical commercial power plant fuel rods contain approximately 2% to 5% 235U; the exact value depends on the details of the reactor design. This fuel remains in the reactor for up to three years or more, at which time fission product buildup necessitates its removal even though it still contains significant quantities of 235U. A nuclear power plant is an arrangement of components used to generate electric power. Nuclear power plants used in the United States (U.S.) are either boiling water reactors (BWRs) or pressurized water reactors (PWRs). Boiling water reactors (Figure 1) use a direct cycle in which water boils in the reactor core to produce steam, which drives a steam turbine. This turbine spins a generator to produce electric power. Pressurized water reactors (Figure 2) use an indirect cycle in which water is heated under high pressure in the reactor core and passes through a secondary heat exchanger to convert water in another loop to steam, which in turn drives the turbine. In the PWR design, radioactive water/steam never contacts the turbine. Except for the reactor itself, there is very little difference between a nuclear power plant and a coal- or oil-fired power plant. The following photos were taken by Giles Thomas in September 2010 inside the Exclusion Zone in Chernobyl. Research into the integrity of containment structures or vessels for nuclear power plants has been conducted around the world in those countries where nuclear energy is produced and provides, or is expected to provide, a significant portion of the domestic energy supply. While the contributions of each of these efforts to the understanding of the role of containment in ensuring the safe operation on nuclear power plants is important, the most comprehensive experimental effort has been conducted at Sandia National Laboratories, primarily under the sponsorship of the US Nuclear Regulatory Commission (NRC). This report describes the background and context for the more than 25 years of NRC-sponsored Containment Integrity Research at Sandia National Laboratories and summarizes the major results of the experimental efforts and the observations and insights gained from the analytical efforts. Tokyo Electric Power Company Integrity Inspection of Dry Storage Casks and Spent Fuels at Fukushima Daiichi Nuclear Power Station from November 16, 2010. An evaluation of the nuclear power plant regulatory basis is performed, as it pertains to those plants that are permanently shutdown (PSD) and waiting or undergoing decommissioning. Four spent fuel storage configurations are examined. Recommendations are provided for those operationally based regulations that could be partially or totally removed for PSD plants without impacting public health and safety. This NUREG contains the improved Standard Technical Specifications (STS) for General Electric (GE) BWR/4 plants. Revision 3 incorporates the cumulative changes to Revision 1 and 2, which was published in April 1995 and April 2001, respectively. The changes reflected in Revision 3 resulted from the experience gained from license amendment applications to convert to these improved STS or to adopt partial improvements to existing technical specifications. This publication is the result of extensive public technical meetings and discussions among the Nuclear Regulatory Commission (NRC) staff and various nuclear power plant licensees, Nuclear Steam Supply System (NSSS) Owners Groups, and the Nuclear Energy Institute (NEI). GE Hitachi BWR Reactor Fuel and ABWR Experience Presentation from September 2008. Hitachi presentation from 2007 on “High Safety” Boiling Water Reactors (BWR). Hitachi manufactured reactor four that is currently involved in the ongoing nuclear crisis at the Fukushima Daiichi Nuclear Power Plant. That reactor is a Boiling Water Reactor (BWR). A presentation given a little over a week before the 2011 Japanese Earthquake promoting nuclear power plant construction by GE Hitachi Nuclear Energy. GE and Hitachi both manufactured reactors which are now currently involved in the ongoing nuclear crisis at the Fukushima Daiichi Nuclear Power Plant. In 2007, the companies’ nuclear divisions merged to form GE Hitachi Nuclear Energy. Thousands of pages of Nuclear Energy Agency Severe Accident Menagement and Containment Safety Assessment Information Documentation from April to December 2010. Some of the documents deal directly with the Fukushima reactors. The Working Group on the Analysis and Management of Accidents (WGAMA) shall be responsible for activities related to potential accidental situations in nuclear power plants, including the following technical areas: reactor coolant system thermal-hydraulics; design-basis accident including ECCS strainer clogging; pre-core melt conditions and progression of accident and in-vessel phenomena; coolability of over-heated cores; ex-vessel corium interaction with concrete and coolant; incontainment combustible gas control; physical-chemical behaviour of radioactive species in the containment; fire safety. The activities will mainly focus on existing reactors, but will also comprise applications for some advanced reactor designs.